Scuba gas planning is the aspect of dive planning which deals with the calculation or estimation of the amounts and mixtures of gases to be used for a planned dive profile. It usually assumes that the dive profile, including decompression, is known, but the process may be iterative, involving changes to the dive profile as a consequence of the gas requirement calculation, or changes to the gas mixtures chosen. Use of calculated reserves based on planned dive profile and estimated gas consumption rates rather than an arbitrary pressure is sometimes referred to as rock bottom gas management. Estimation of gas required for the planned dive, including bottom gas, travel gas, and decompression gases, as appropriate to the profile. Estimation of gas quantities for reasonably foreseeable contingencies. Choice of cylinders to carry the required gases. Each cylinder volume and working pressure must be sufficient to contain the required quantity of gas. Calculation of the pressures for each of the gases in each of the cylinders to provide the required quantities. Specifying the critical pressures of relevant gas mixtures for appropriate stages (waypoints) of the planned dive profile. The choice of breathing gas for scuba diving is from four main groups. Air is the default gas for most shallow recreational diving, and in some parts of the world it may be the only gas easily available. It is freely available, consistent in quality and easily compressed. If there were no problems associated with the use of air for deeper and longer dives, there would be no reason to use anything else. the effects of nitrogen narcosis at depths greater than about 30 m, but depending on the individual diver. limitations on no-decompression stop diving and decompression duration due to solution of nitrogen in the body tissues. These limitations may be mitigated by the use of gases blended specifically for breathing under pressure. In an effort to reduce the decompression problems resulting from the high partial pressures of nitrogen the diver is exposed to when breathing air at depth, oxygen may be added as a substitute for some of the nitrogen. The resulting mixture of nitrogen and oxygen is known as nitrox. The traces of argon and other atmospheric gases are considered to be unimportant. Nitrox is a mixture of nitrogen and oxygen. Technically this can include hypoxic nitrox mixtures, where the gas fraction of oxygen is less than in air (21%), but these are not generally used. Nitrox is generally understood as air enriched by additional oxygen. Gas fraction of oxygen may range from 22% to 99%, but is more usually in the range of 25% to 40% for bottom gas (breathed during the main part of the dive), and 32 to 80% for decompression mixtures. Helium is an inert gas which is used in breathing mixtures for diving to reduce or eliminate the narcotic effects of other gases at depth. It is a relatively expensive gas and has some undesirable side effects, and as a result is used where it significantly improves safety. Another desirable feature of helium is low density and low viscosity compared to nitrogen. These properties reduce work of breathing, which can become a limiting factor to the diver at extreme depths. Undesirable properties of helium as a breathing gas component include highly effective heat transfer, which can chill a diver rapidly, and a tendency to leak more easily and rapidly than other gases. Helium based mixtures should not be used for dry-suit inflation. Helium is less soluble than nitrogen in body tissues, but as a consequence of its very small molecular weight of 4, compared with 28 for nitrogen, it diffuses faster as is described by Graham's Law. Consequently, the tissues saturate faster with helium, but also desaturate faster, provided bubble formation can be avoided. Decompression of saturated tissues will be faster for helium, but unsaturated tissues may take longer or shorter than with nitrogen depending on the dive profile. Helium is usually mixed with oxygen and air to produce a range of effectively three component gas blends known as Trimixes. Oxygen is limited by toxicity constraints, and nitrogen is limited by acceptable narcotic effects. Helium is used to make up the rest of the mixture. Pure oxygen completely eliminates the decompression problem, but is toxic at high partial pressures, which limits its use in diving to shallow depths and as a decompression gas. 100% oxygen is also used to replenish oxygen used by the diver in closed circuit rebreathers, to maintain the set point — the partial pressure of oxygen in the loop that the electronics or diver maintains during the dive. In this case the actual breathing mixture varies with the depth, and is made up of a diluent blend mixed with oxygen. The diluent is usually a gas blend that can be used for bailout if necessary. Relatively small amounts of diluent are used in a rebreather, as the inert components are neither metabolised nor exhausted to the environment while the diver remains at depth, but are rebreathed repetitively, only being lost during ascent, when the gas expands in inverse proportion to the pressure, and must be vented to maintain the correct volume in the loop. The mix must be chosen to provide a safe partial pressure of oxygen (PO2) at the working depth. There are also decompression considerations: The amount of inert gas that will dissolve in the tissues depends on the partial pressure of the gas and the time at pressure. At a given temperature, the amount of gas that can dissolve in a fluid is directly proportional to the partial pressure of the gas. On short duration dives the PO2 can be raised to 1.2 to 1.6 bar. This reduces the PN2 and/or PHe, and will shorten the required decompression for a given profile. Breathing air deeper than 30 metres (100 ft) (pressure > 4 bar) has a significant narcotic effect on the diver. As helium has no narcotic effect, this can be avoided by adding helium to the mixture so that the partial pressure of narcotic gases remains below a debilitating level. This varies depending on the diver, and there is significant cost in helium mixtures, but the increased safety and efficiency of work resulting from helium use can be worth the cost. The other disadvantage of helium based mixtures is the increased cooling of the diver. Dry suits should not be inflated with helium-rich mixtures. Apart from helium, and probably neon, all gases that can be breathed have a narcotic effect which increases with raised partial pressure, with oxygen known to have a narcotic effect comparable to that of nitrogen. These are optimum values for minimizing decompression and helium cost. A lower fraction of oxygen would be acceptable, but would be a disadvantage for decompression, and a higher fraction of helium would be acceptable but cost more. The amount of gas needed on a dive depends on whether the scuba equipment to be used is open, semi-closed or closed circuit. Open circuit diving exhausts all respired gas to the surroundings, regardless of how much has been useful to the diver, whereas a semi-closed or closed circuit system retains most of the respired gas, and restores it to a respirable condition by removing the waste product carbon dioxide, and making up the oxygen content to a suitable partial pressure. Closed and semi-closed circuit scuba sets are also known as rebreathers. Another aspect of scuba configuration is how the primary cylinders are carried by the diver. The two basic arrangements are back mount and side mount. Back mount is the system where one or more cylinders are firmly attached to a harness, usually with a buoyancy compensator jacket or wing, and carried on the diver's back. Back mount allows cylinders to be manifolded together as twins, or for special circumstances, trips or quads. It is a high profile arrangement and may be unsuited to some sites where the diver needs to pass through low openings. This is the standard configuration for single or twin cylinder recreational diving, and for much technical diving in open water. Side mounting suspends the primary cylinders from the harness at the diver's sides: usually two cylinders of approximately equal size would be used. Additional decompression cylinders may be attached in a similar way. The method of carrying cylinders suspended at the sides of the harness known as sling mounting is similar and differs in detail. Decompression gas, when different from the gas used for the main part of the dive, is commonly carried in one or more cylinders suspended from the side of the diver's harness by clips. Multiple cylinders may be carried this way for extreme dives. Bailout gas may be carried in a variety of ways in a bailout cylinder. The most popular being as a sling cylinder, a pony cylinder strapped to the primary back mounted cylinder, or in a small cylinder (Spare air) supported by a pocket attached to the buoyancy compensator. If the route of the dive is constrained or can be reliably planned, cylinders for bailout of decompression gas can be dropped along the route at the points where they will be needed on the return or ascent. The cylinders are usually clipped to a distance line or shot line, to ensure that they are easy to find and unlikely to get lost. These cylinders would typically contain a gas mixture close to optimal for the sector of the dive in which they are intended to be used. This procedure is also known as staging, and the cylinders then known as stage cylinders, but the term stage cylinder has become generic for any cylinder carried at the diver's side in addition to the bottom gas. Gas consumption depends on the ambient pressure, the breathing rate, and the duration of the dive sector under those conditions. Ambient pressure is a direct function of the depth. It is atmospheric pressure at the surface, plus hydrostatic pressure, at 1 bar per 10m depth. Respiratory minute volume (RMV) is the volume of gas that is breathed by a diver in a minute. For a working commercial diver IMCA suggests RMV = 35 l/min. For emergencies IMCA suggests RMV = 40 l/min Decompression RMV is usually less as the diver is not generally working hard. Smaller values can be used for estimating dive times, The diver can use measured valued for him/herself, but worst case values should be used to calculate critical pressures for turnaround or ascent and for rescue, as the RMV of a diver will usually increase with stress or exertion. Gas consumption rate (Q) on open circuit depends on absolute ambient pressure (Pa) and RMV. The available volume of gas in a cylinder is the volume which may be used before reaching a critical pressure, generally known as the reserve. The value chosen for reserve should be sufficient for the diver to make a safe ascent in sub-optimal conditions. It may require supply of gas to a second diver (buddy breathing) Available gas may be corrected to surface pressure, or specified at a given depth pressure. The Available gas and the RMV must both be correct for the depth, or both corrected to surface pressure. Calculation of gas requirement for a dive can be broken up into simpler estimates for gas requirement for sectors of the dive, and then added together to indicate the requirement for the entire dive. A dive sector should be at a constant depth, or an average depth can be estimated. This is used to get the sector ambient pressure (Psector). The duration of the sector (Tsector) and RMV of the diver for the sector (RMVsector) must also be estimated. If the sector gas volume requirements (Vsector) are all calculated at surface pressure, they can later be added directly. This reduces the risk of confusion and error. Breathing gas regulators will work efficiently down to a cylinder pressure slightly above the designed interstage pressure. This pressure may be called minimum functional cylinder pressure. It will vary with depth as the nominal interstage pressure is additional to the ambient pressure. This does not mean that all the remaining gas is unobtainable from a cylinder; rather that the regulator will deliver some of it less efficiently than the designed work of breathing, and the rest only when the ambient pressure is reduced. In most regulator designs the diver will have to overcome a larger cracking pressure to open the demand valve, and flow rate will be reduced. These effects increase as the interstage pressure decreases. This can provide the diver with a warning that gas supply from that cylinder will immanently cease. However, in at least one regulator design, once the interstage pressure has been sufficiently reduced, the inflatable second stage servo-valve will deflate and effectively lock open the demand valve, allowing the residual gas to escape until the cylinder pressure has dropped to approximately equal the ambient pressure, at which point flow will stop until the ambient pressure is reduced by ascending to shallower depth. A value of 10 bar interstage pressure plus ambient pressure is a suitable estimate for minimum functional pressure for most planning purposes. This value will vary with the depth, and a regulator that has stopped delivering breathing gas may deliver a little more gas as the ambient pressure decreases, allowing a few more breaths from the cylinder during ascent if the gas is used up during the dive. The amount of gas available in this way depends on the internal volume of the cylinder. Critical pressures (Pcritical or Pcrit) are pressures that must not be dropped below during a given part of a planned dive as they provide gas for emergencies. Reserve pressure is an example of a critical pressure. This is also known as Critical Pressure of Ascent, as this indicates the amount of gas required to safely ascend with allowances for specific contingencies listed in the dive plan. Critical pressures may also be specified for the start of the dive and for turnaround where direct ascent is not possible or not desirable. These can be called Critical Pressure of Descent or Critical Pressure for the Dive Profile, and Critical Pressure of Exit or Critical Pressure of Turnaround. Critical pressures are calculated by adding up all the volumes of gas required for the parts of the dive after the critical point, and for other functions such as suit inflation and buoyancy control if these are supplied from the same set of cylinders, and dividing this total volume by the volume of the cylinder set. A minimum functional pressure is added to this value to give the critical pressure. This dive should not be attempted if less than 176 bar is available. Note that no allowance has been made for contingencies. The temperature of the gas should be taken into account when checking critical pressures. Critical pressures for ascent or turnaround will be measured at ambient temperature and do not require compensation, but critical pressure for descent may be measured at a temperature considerably higher than the temperature at depth. Pressure should be corrected to the expected water temperature using Gay-Lussac's law. The basic problem with estimating a gas allowance for contingencies is to decide what contingencies to allow for. This is addressed in the risk assessment for the planned dive. A commonly considered contingency is to share gas with another diver from the point in the dive where the maximum time is needed to reach the surface or other place where more gas is available. It is likely that both divers will have a higher than normal RMV during an assisted ascent as it is a stressful situation. It is prudent to take this into account. The values should be chosen according to recommendations of the code of practice in use or the training agency, but if a higher value is chosen it is unlikely that anyone would object. Recreational divers may have the discretion to use RMV values of their own choice, based on personal experience and informed acceptance of risk. The procedure is identical to that for any other multi-sector gas consumption calculation, except that two divers are involved, doubling the effective RMV. To check whether the bail-out cylinder has adequate gas (for one diver) in case of an emergency at the planned depth, critical pressure should be calculated based on the planned profile and should allow change-over, ascent and all planned decompression. The fundamental decision in choice of cylinders is whether the entire gas supply for the dive is to be carried in one set, or is to be divided into more than one set for different parts of the dive. Diving with a single cylinder is logistically simple, and makes all the gas available for breathing throughout the dive, but can not take advantage of optimising the breathing gas for decompression, or having an independent emergency supply that does not rely on the presence of a dive buddy where and when needed. 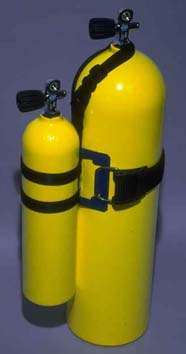 A single cylinder puts the diver in a position of dependence on the buddy for alternative breathing gas in case of an emergency cutting off the main air supply, unless the option of a free ascent is acceptable. Diving with multiple cylinders is done for three basic reasons, or a combination of the three. A fully independent supply of breathing gas is provided for emergencies where the primary gas supply is interrupted. This is generally termed bailout gas, and may be carried in a bailout cylinder, which may be a pony cylinder, or the primary gas supply may be split and carried in two (or more) similarly sized independent primary cylinders. Gas mixtures optimised for accelerated decompression may be carried. Typically these gases are not suitable for breathing at maximum dive depth due to excessive oxygen fraction for the depth, so are not ideal for bailout from maximum depth. The bottom gas may be hypoxic and unsuitable for breathing at the surface. A travel gas may be used to transit the hypoxic range. It may be possible to use one of the decompression mixtures as a travel gas, which would reduce the number of cylinders carried. Deep open circuit technical dives may require a combination of bottom gas, travel gas and two or more different decompression gases, which poses a challenge to the diver of how to carry them all and use them correctly, as misuse of a gas in an inappropriate depth range can lead to hypoxia or oxygen toxicity, and will also affect decompression obligations. Each gas must be provided in sufficient quantity to adequately supply the diver throughout the relevant sector(s) of the dive. This is done by selecting a cylinder which when filled can contain at least the required amount of gas, including any relevant reserve and contingency allowance, above the minimum functional pressure at the depth where the gas will last be used. Buoyancy and trim consequences of the tank choice should be considered, both as a consequence of the inherent buoyancy characteristics of the cylinder complete with regulator and other accessories, and due to the use of the contents during the dive. The diver must carry sufficient weight to remain neutral at the shallowest decompression stop after all the gas has been used. This will result in the diver being somewhat negative at the start of the dive, and the buoyancy compensator must have sufficient volume to neutralise this excess. Calculation of the required weight and buoyancy volume can be done if the mass of the stored gas is known. A simple method for calculating the mass of a volume of gas is to calculate the mass at STP, at which densities for gases are available. The mass of each component gas is calculated for the volume of that component calculated using the gas fraction for that component. The mass of the helium is a small part of the total. and density of oxygen and nitrogen are fairly similar. A reasonable approximation is to use the volume at 20 °C, ignore the mass of helium and take all nitrox and air components to be 1.3 kg/m3. This method will seldom be out by as much as a kg, which is close enough for buoyancy estimates for most open circuit scuba mixes. A conventional configuration for this type of diving is to carry the bottom gas in back-mounted cylinders of sufficient total volume, either manifolded or independent, and the other mixes in sling-mounts clipped off to the sides of the diver's harness on D-rings. One of the conventions puts the oxygen rich gases to the right. The diver must be able to positively identify the gas supplied by any one of the several demand valves that this configuration requires. Sidemount harnesses require the cylinders to be carried individually clipped to the harness at the sides of the diver. Skilled sidemount exponents can carry 6 aluminum 80 cylinders this way, 3 each side. ↑ U.S. Naval Sea Systems Command, (2008), SS521-AG-PRO-010: U.S. Navy Diving Manual, Revision 6, U.S Government Printing Office, Washington, DC. ↑ "Heliox21". Linde Gas Therapeutics. 27 January 2009. Retrieved 14 November 2011. ↑ Brubakk, A. O.; T. S. Neuman (2003). Bennett and Elliott's physiology and medicine of diving, 5th Rev ed. United States: Saunders Ltd. ISBN 0-7020-2571-2. ↑ Bennett, Peter; Rostain, Jean Claude (2003). "Inert Gas Narcosis". In Brubakk, Alf O; Neuman, Tom S. Bennett and Elliott's physiology and medicine of diving (5th ed.). United States: Saunders Ltd. p. 304. ISBN 0-7020-2571-2. OCLC 51607923. ↑ "Mixed-Gas & Oxygen". NOAA Diving Manual, Diving for Science and Technology. 4th. National Oceanic and Atmospheric Administration. 2002. [16.3.1.2.4] ... since oxygen has some narcotic properties, it is appropriate to include the oxygen in the END calculation when using trimixes (Lambersten et al. 1977,1978). The non-helium portion (i.e., the sum of the oxygen and the nitrogen) is to be regarded as having the same narcotic potency as an equivalent partial pressure of nitrogen in air, regardless of the proportions of oxygen and nitrogen. ↑ Buzzacott P, Rosenberg M, Heyworth J, Pikora T (2011). "Risk factors for running low on gas in recreational divers in Western Australia". Diving and Hyperbaric Medicine. 41 (2): 85–9. PMID 21848111. Retrieved 2016-01-07. This article is issued from Wikipedia - version of the 6/5/2016. The text is available under the Creative Commons Attribution/Share Alike but additional terms may apply for the media files.